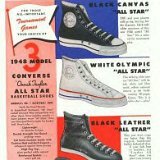 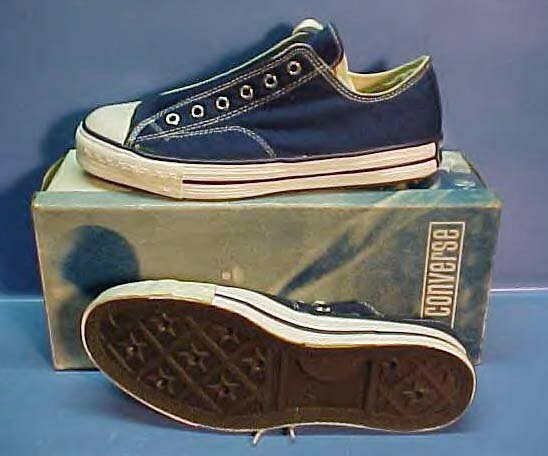 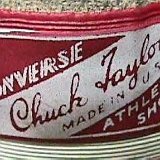 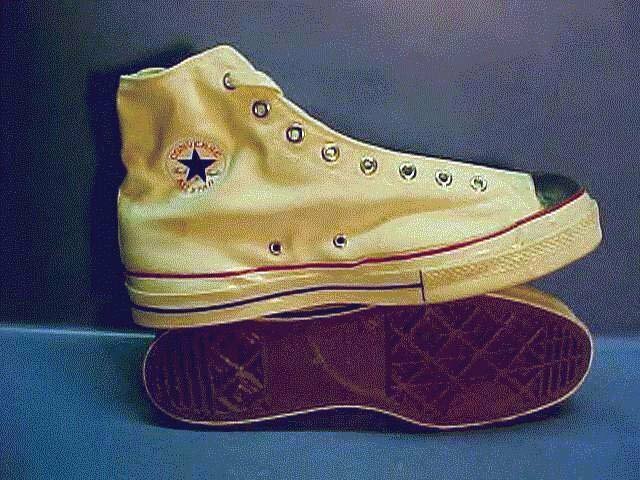 Photo gallery of vintage advertisements and models of chucks from the past century. 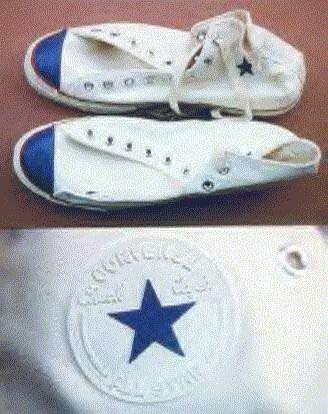 1 Collectors Items White blue toe high tops, made in the 1950s. 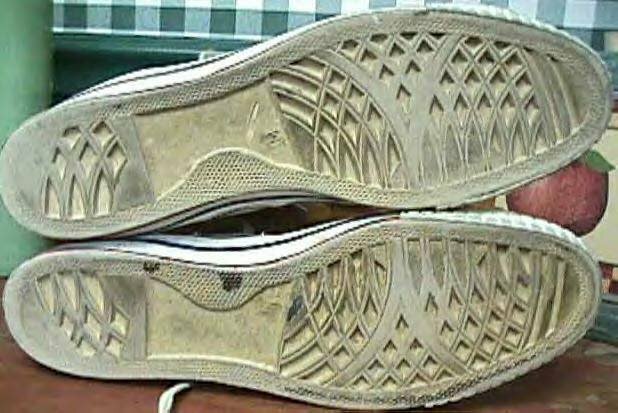 inside patch and sole views. 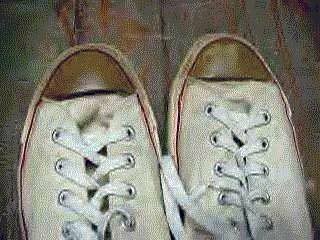 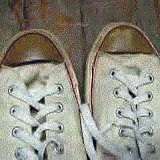 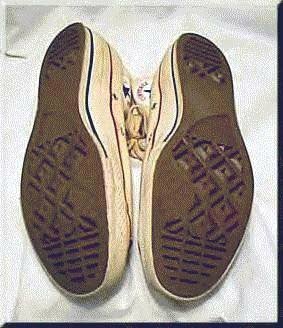 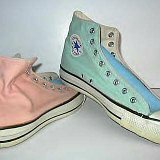 2 Collectors Items Blue toe white high tops, made in the 1950s, front and rear views. 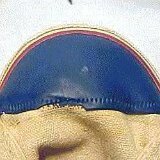 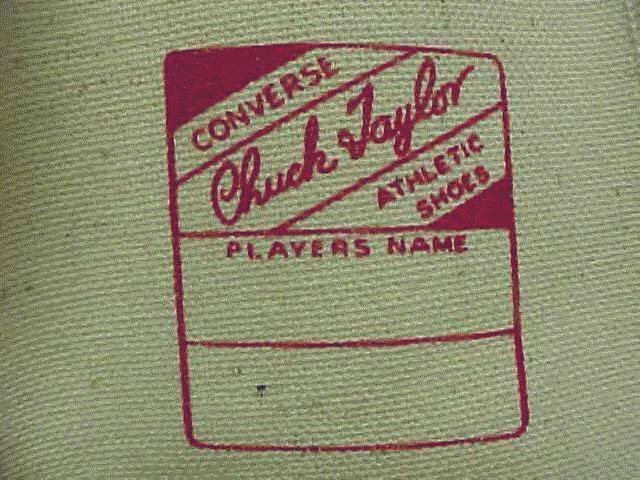 3 Collectors Items Close up of the player's name area on the inside of the tongue from a 1950s blue toe white high top. 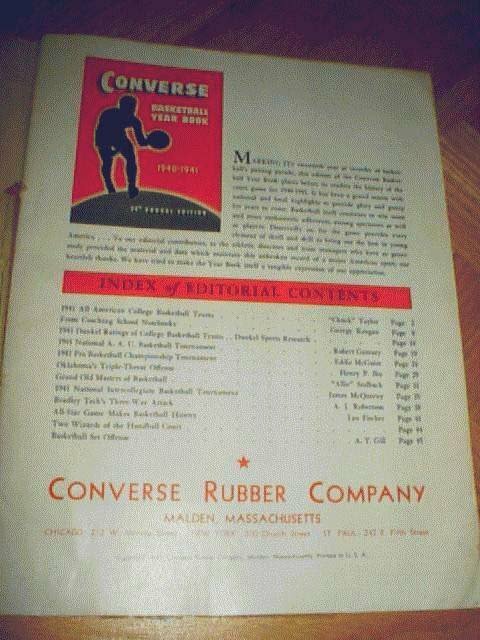 4 Collectors Items 1937-38 Converse Basketball yearbook. 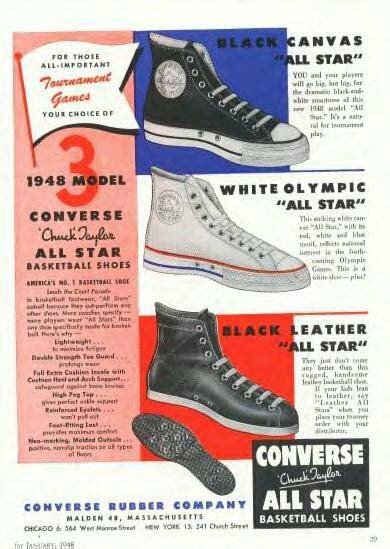 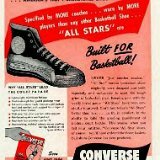 5 Collectors Items 1942 Converse All Star advertisement. 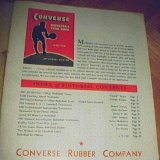 6 Collectors Items Page from a 1942 Converse Yearbook. 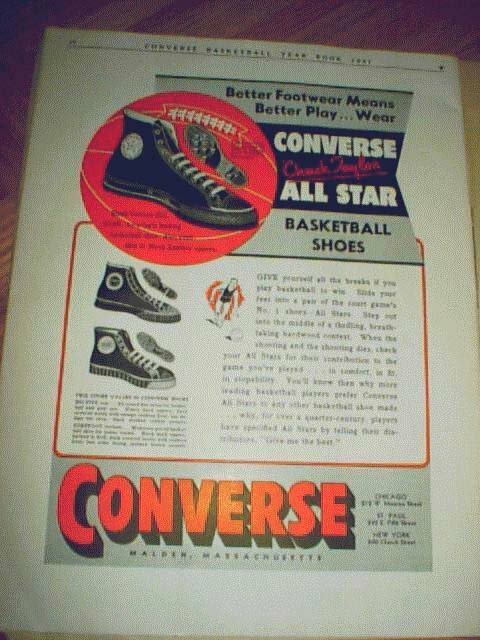 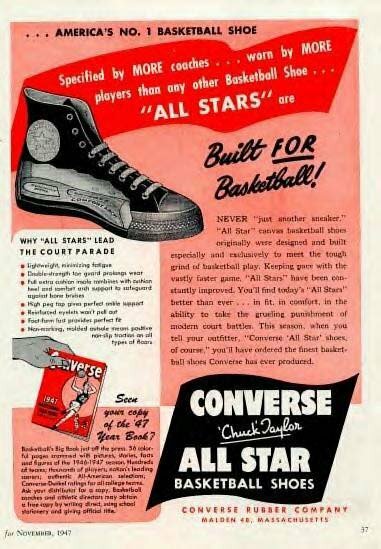 7 Collectors Items 1947 Converse All Star advertisment. 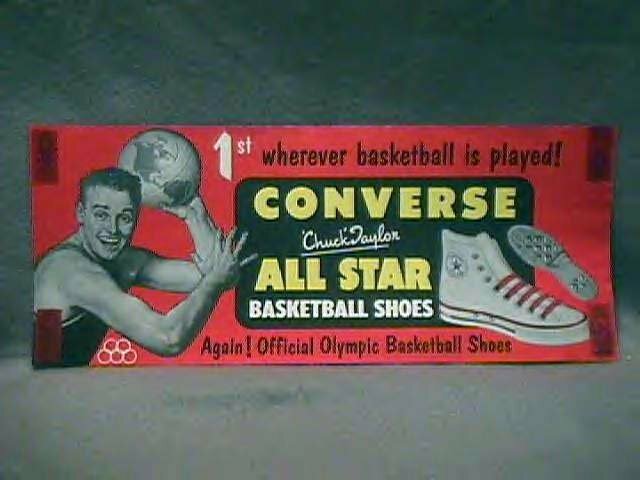 8 Collectors Items 1948 Converse All Star advertisment. 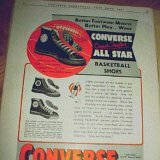 9 Collectors Items 1950 Converse All Star poster ad. 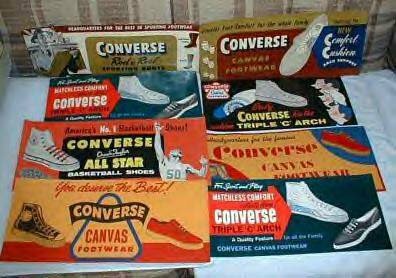 10 Collectors Items 1950s Converse advertisements. 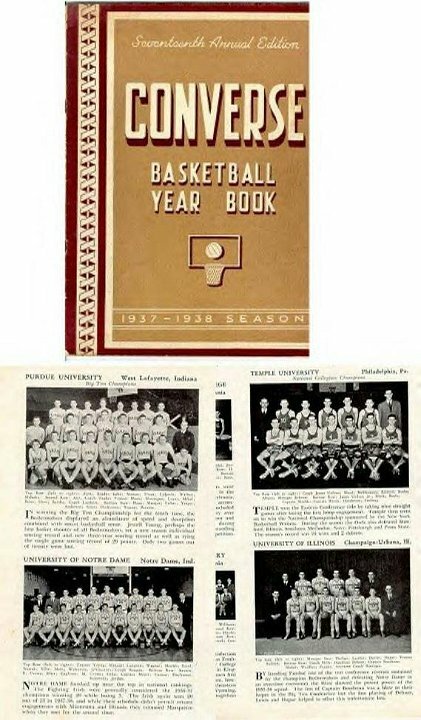 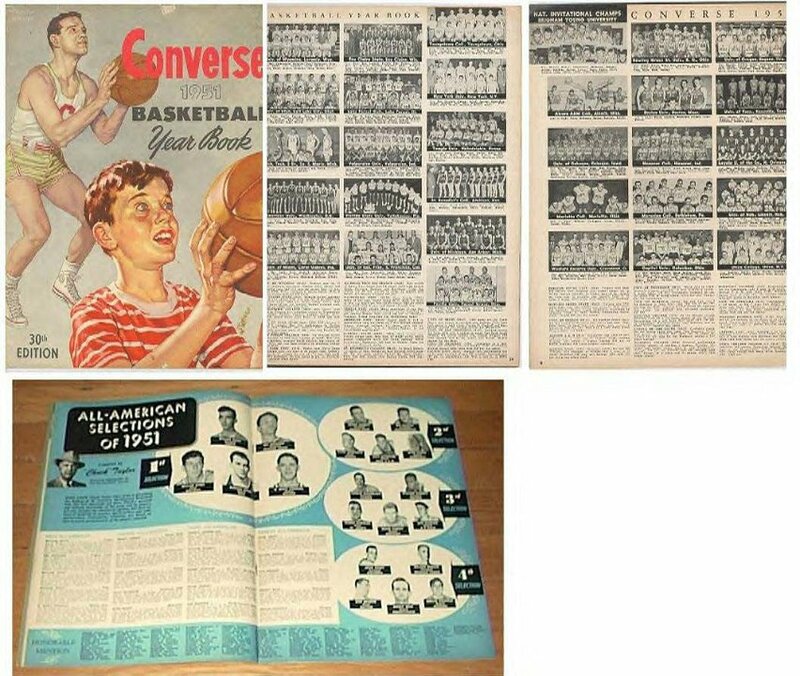 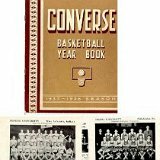 11 Collectors Items 1951 Converse Basketball Yearbook pages. 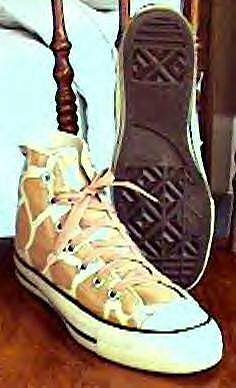 12 Collectors Items 1960s vintage white high tops, rear view. 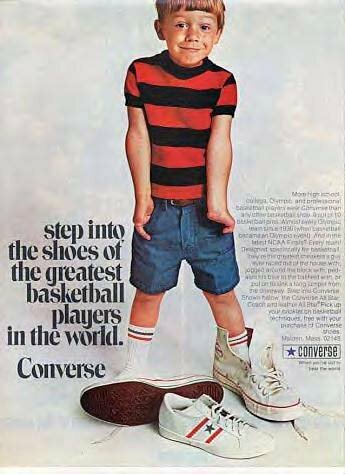 13 Collectors Items 1970 Converse advertisment. 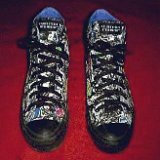 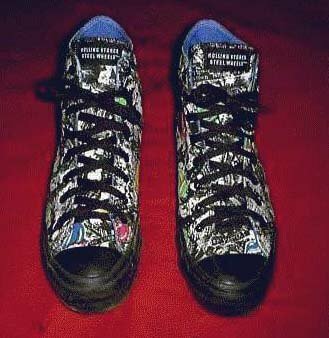 14 Collectors Items Aerosmith high tops, angled side views. 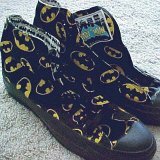 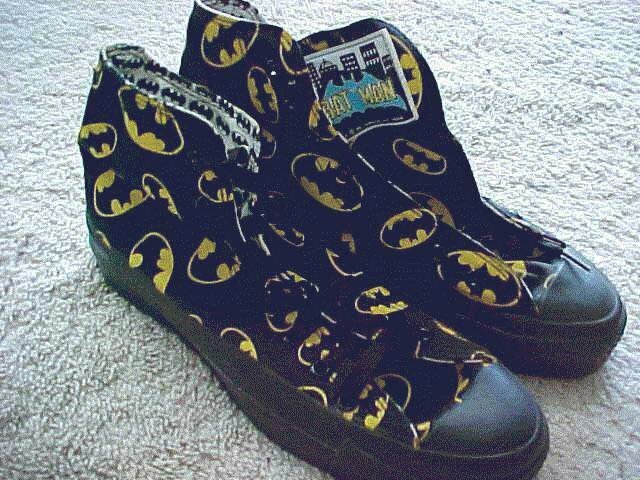 15 Collectors Items Batman high tops, angled side view. 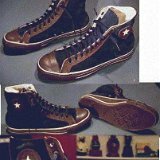 16 Collectors Items Vintage black leather high tops, side and sole views. 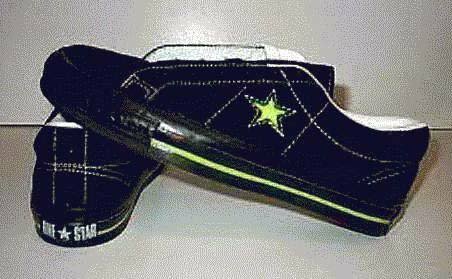 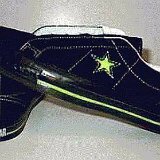 17 Collectors Items Black and neon lime one star, rear and side views. 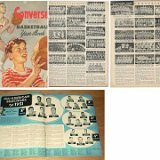 18 Collectors Items Collage of blue and brown 1917 retro high tops. 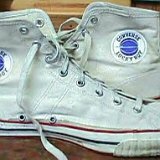 19 Collectors Items Top view of vintage white hightops with blue toecaps. 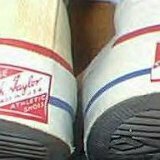 20 Collectors Items Closeup of the heel patches of vintage white high tops. 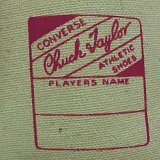 21 Collectors Items Closeup of the inside patches of vintage white high tops. 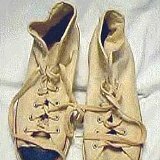 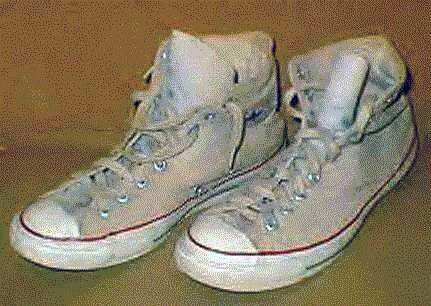 22 Collectors Items Sole view of vintage white high tops. 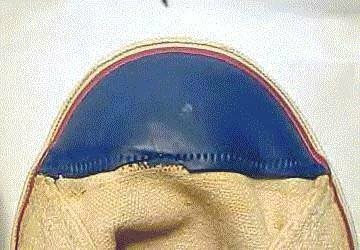 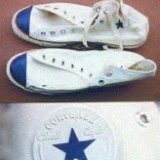 23 Collectors Items Closeup of the blue toecap on a vintage right white high top. 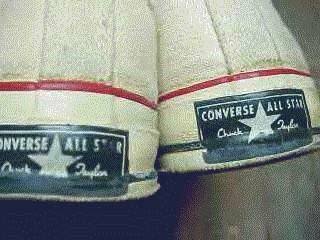 24 Collectors Items Inside patch closeup and top view of optical white blue toecap high top chucks. 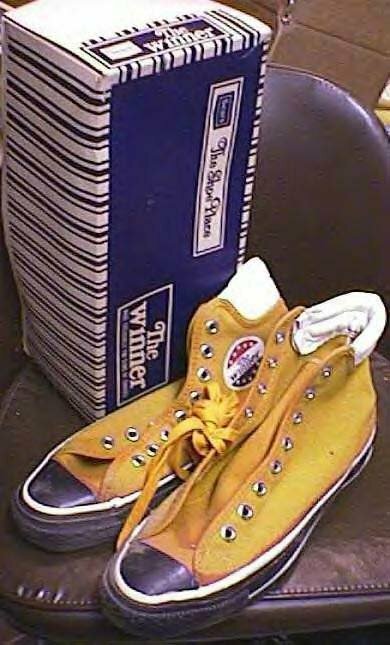 25 Collectors Items Winner high tops with blue foxing and toecaps and yellow canvas uppers, angled side and top view with box. 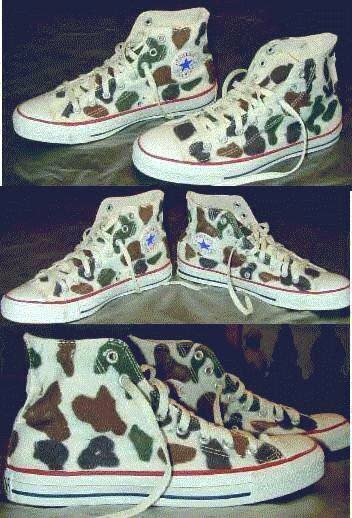 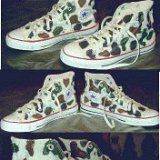 26 Collectors Items Collage of vintage camouflage high tops. 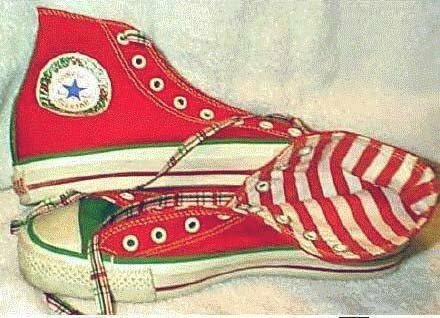 27 Collectors Items Vintage Christmas high tops in red and green, with red striped interior. 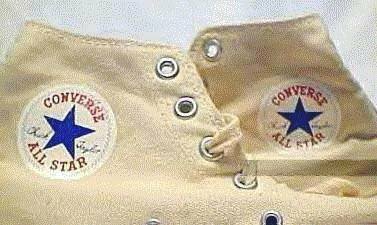 28 Collectors Items Converse All Star hiking boots, inside patch and rear views. 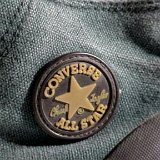 29 Collectors Items Converse All Star hiking boots, inside patch and sole views. 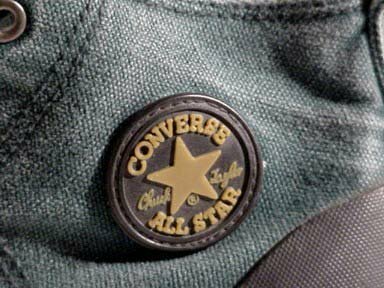 30 Collectors Items Closeup of the inside patch on Converse All Star hiking boots. 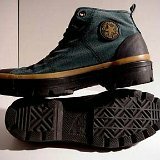 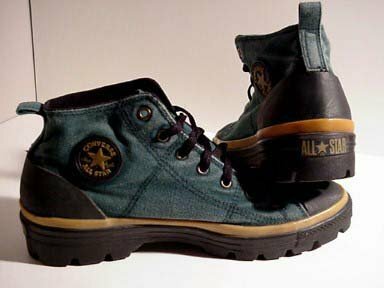 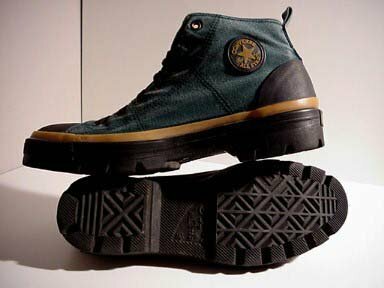 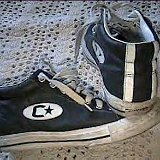 31 Collectors Items Worn Converse All Star hiking boots, front and inside patch views. 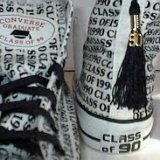 32 Collectors Items Class of 1990 pattern high tops with tassel, angled front and rear views. 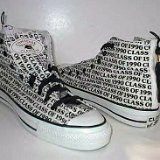 33 Collectors Items Class of 1990 pattern high tops, front and rear views. 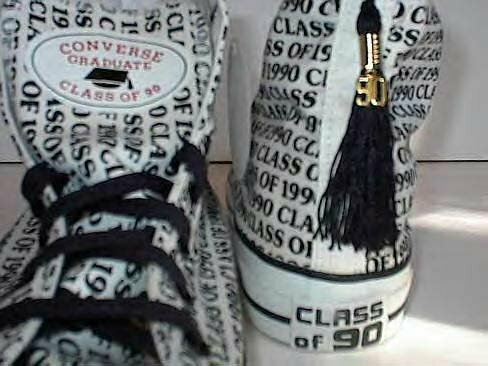 34 Collectors Items Closeup of the Class of 1990 high tops showing the tassel and special tongue patch. 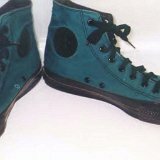 35 Collectors Items Converse All Star mountain club high tops in bright blue and black. 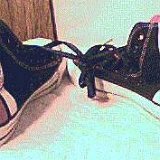 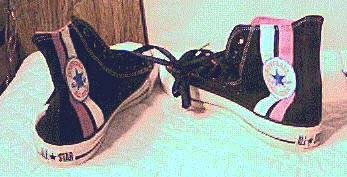 36 Collectors Items Converse black high tops with pink and white stripes and black laces, side views. 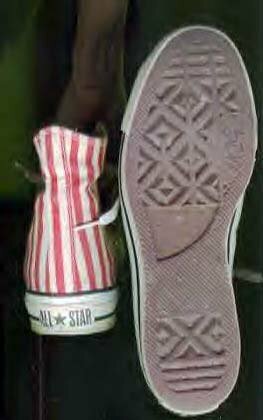 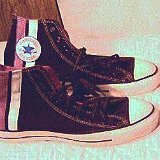 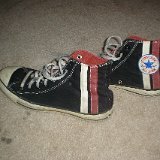 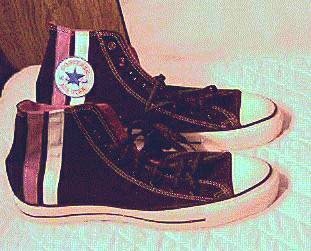 37 Collectors Items Rear view of black Chuck Taylor high tops with white and pink stripes. 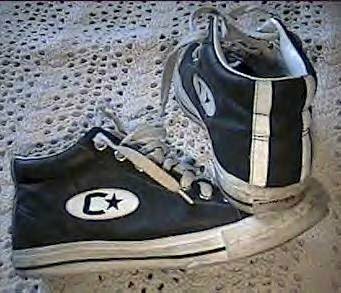 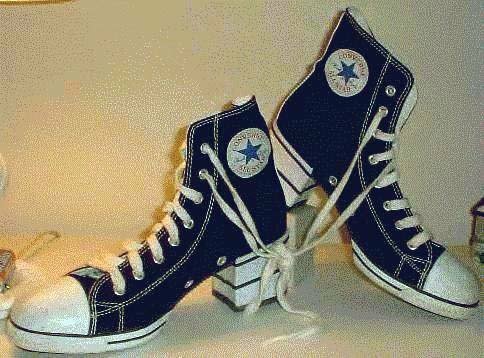 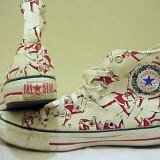 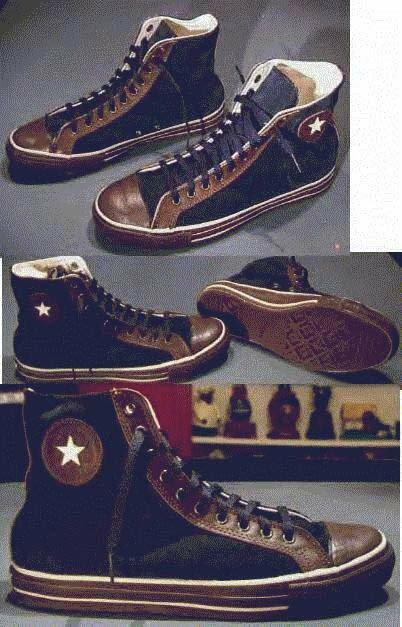 38 Collectors Items Converse C Star high tops, side and rear views. 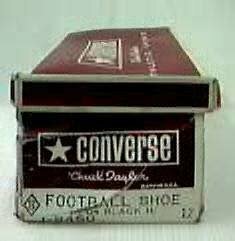 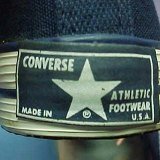 39 Collectors Items Box for vintage Converse All Star Chuck Taylor black high top football shoes. 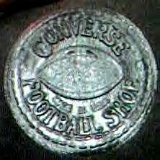 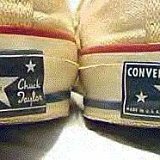 40 Collectors Items Converse Chuck Taylor football shoes, angled top view. 41 Collectors Items Closeup of the metallic football shoe patch. 42 Collectors Items Converse black high top football shoes with cleats. 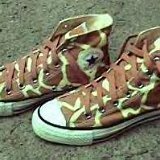 43 Collectors Items Giraffe pattern high tops, angled side views. 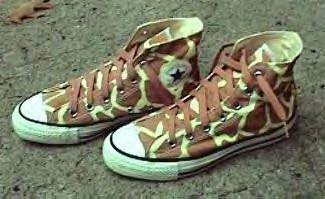 44 Collectors Items Giraffe pattern high tops, front and sole views. 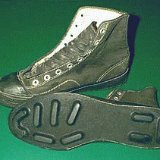 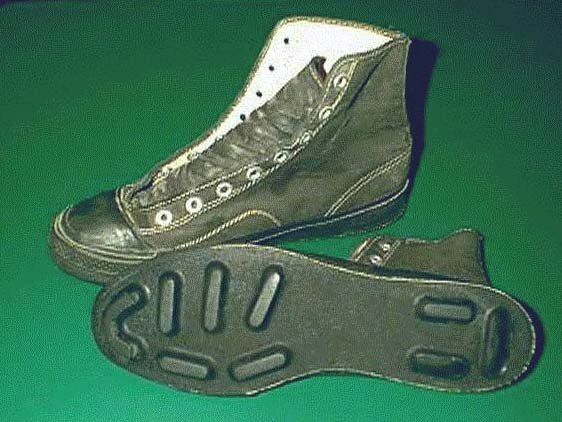 45 Collectors Items Green and black 1917 retro high tops, angled front views. 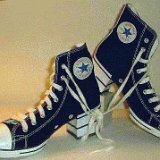 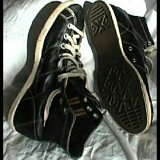 46 Collectors Items Black high heeled sneakers, inside patch views. 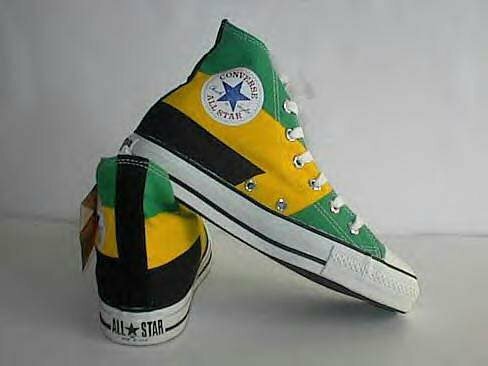 47 Collectors Items Jamaican tricolor high tops in green, black and yellow, angled side views. 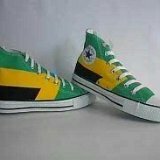 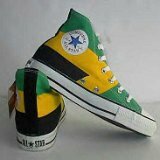 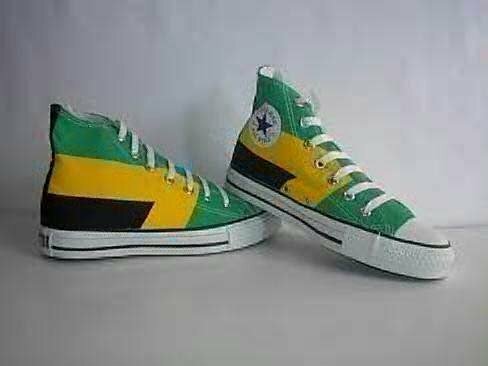 48 Collectors Items Jamaican tricolor high tops, in green, yellow, and black, rear and inside patch views. 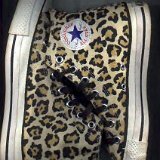 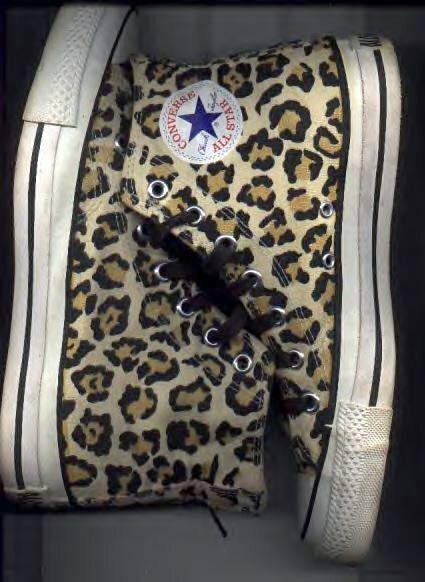 49 Collectors Items Leopard print high tops, side views. 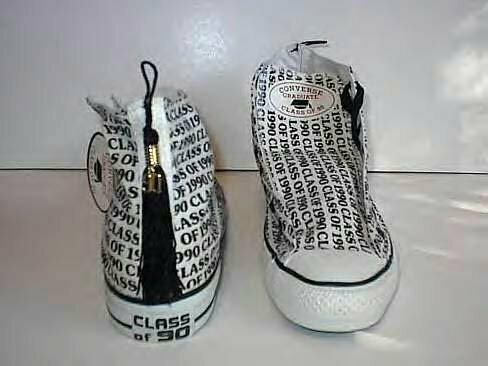 50 Collectors Items L.L. 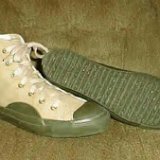 Bean high tops in khaki and olive green, angled side views. 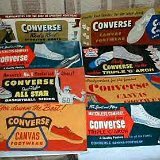 51 Collectors Items L.L. 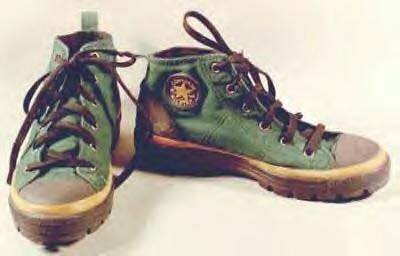 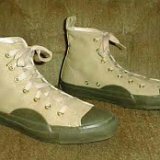 Bean high top chucks in khaki and olive green, angled side and sole views. 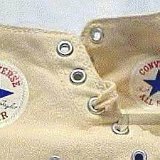 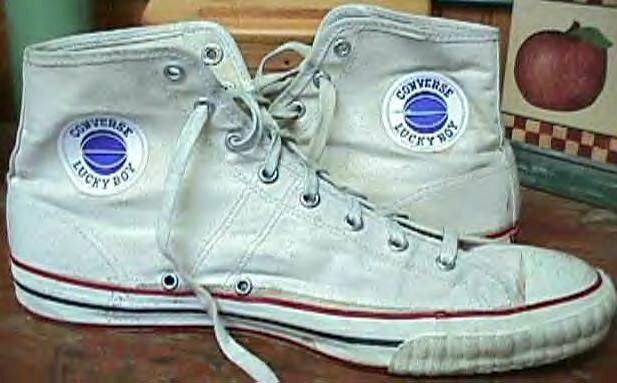 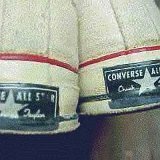 52 Collectors Items Converse "Lucky Boy" white high tops, inside patch views. 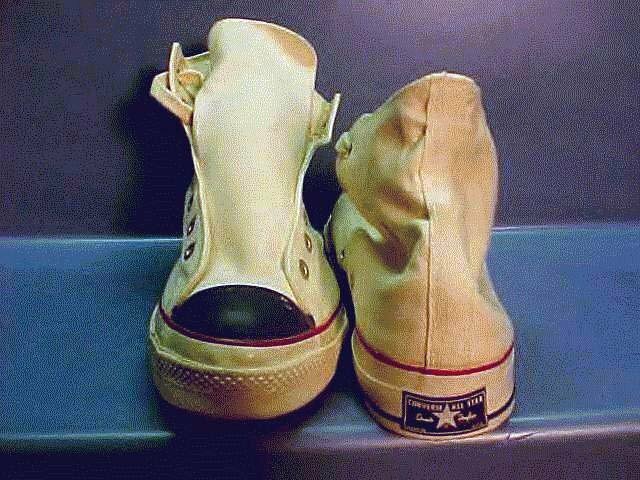 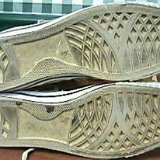 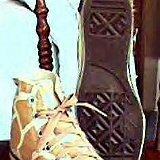 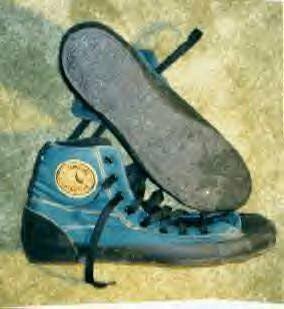 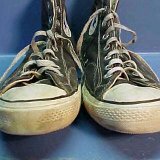 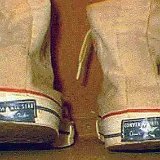 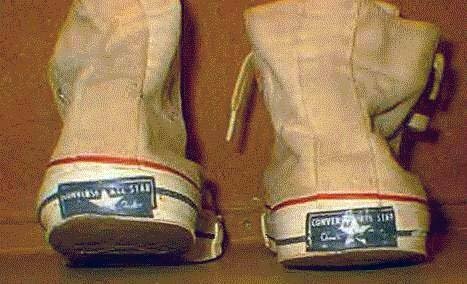 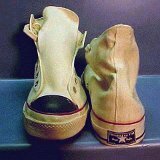 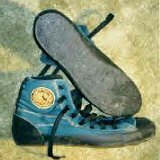 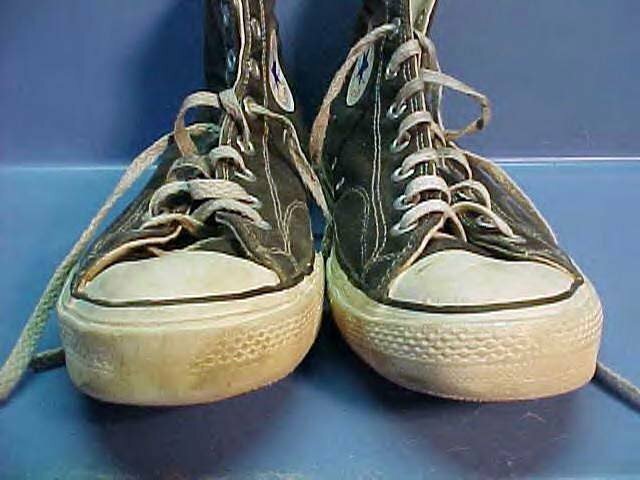 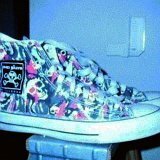 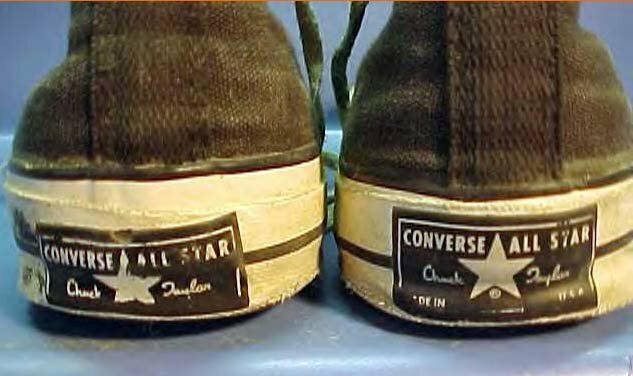 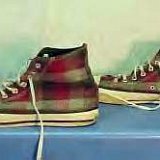 53 Collectors Items Converse "Lucky Boy" high tops, sole view. 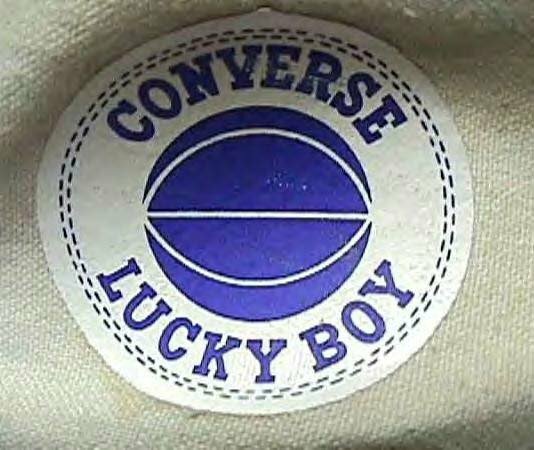 54 Collectors Items Closeup of the "Lucky Boy" inside patch. 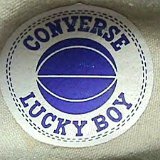 55 Collectors Items Heel patch for Converse "Lucky Boy" high tops. 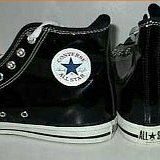 56 Collectors Items Black patent leather high tops, inside patch views. 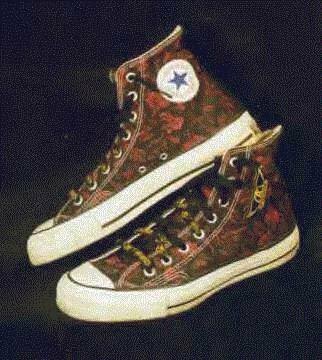 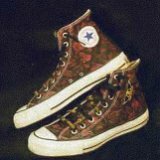 57 Collectors Items Pattern high tops for a band. 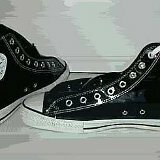 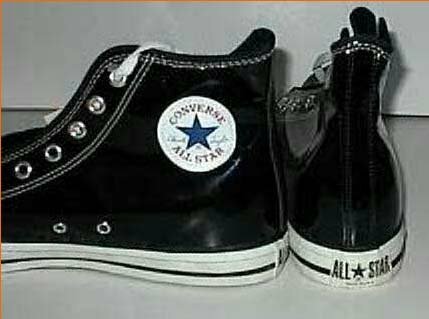 58 Collectors Items Converse black patent leather high tops, inside patch and rear views. 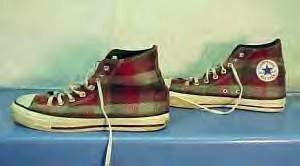 59 Collectors Items Plaid high tops, side view. 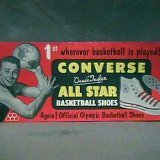 60 Collectors Items 1917 red retro high tops. 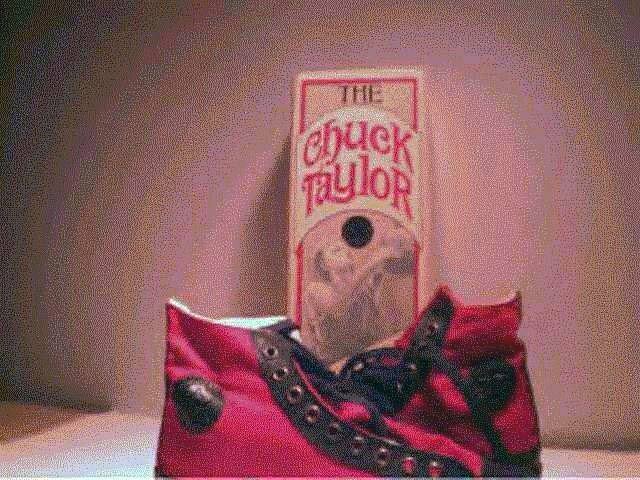 61 Collectors Items Red retro high tops, reissue of 1917 model. 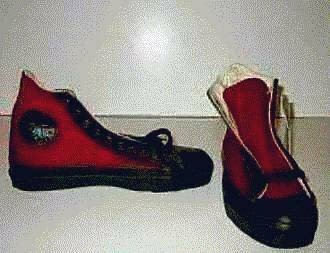 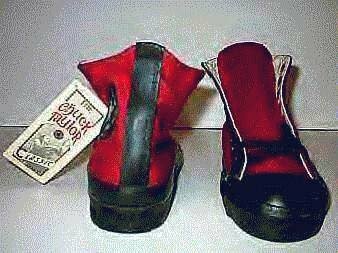 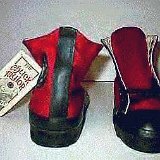 62 Collectors Items Red and black 1917 retro high tops, front and rear views. 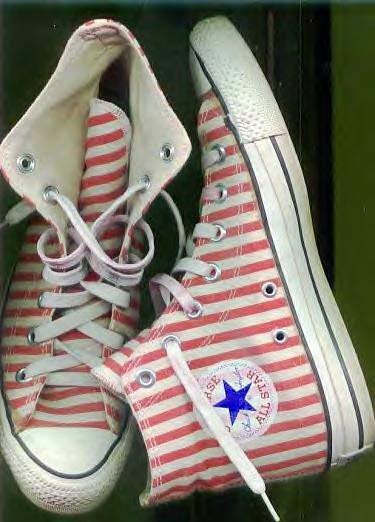 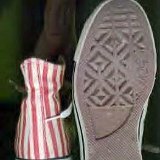 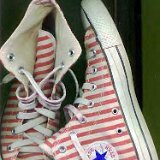 63 Collectors Items Candy striped red and white high tops, top and inside patch views. 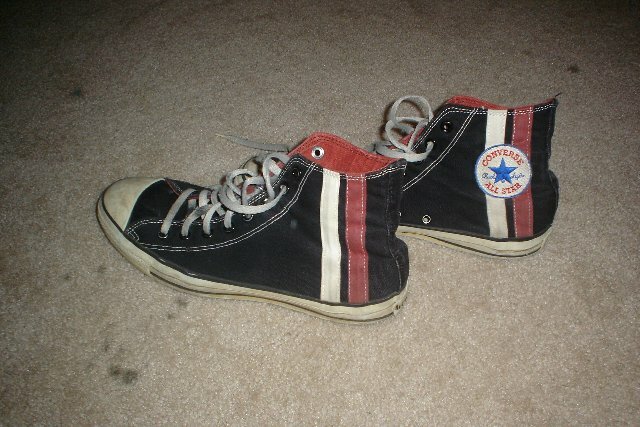 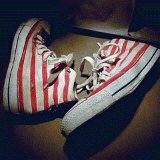 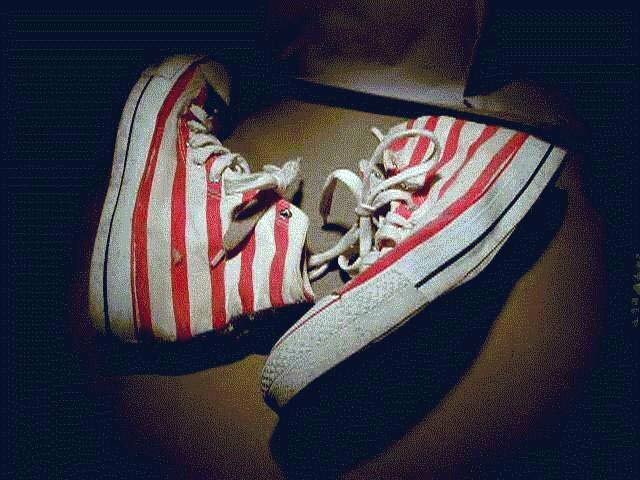 64 Collectors Items Candy striped red and white high tops, outer sole and rear views. 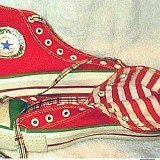 65 Collectors Items Red and white zebra pattern high tops, outside views. 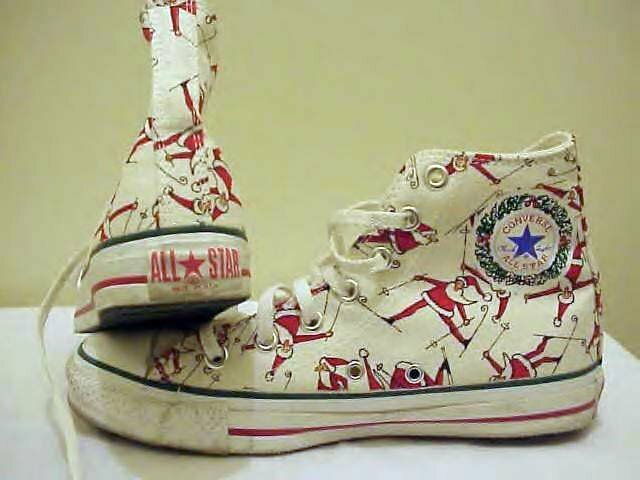 66 Collectors Items Skiing Santa pattern Christmas high tops, inside patch and rear views. 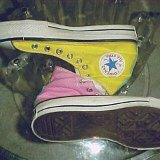 67 Collectors Items Tricolor high tops in yellow, pink, and teal, outside views. 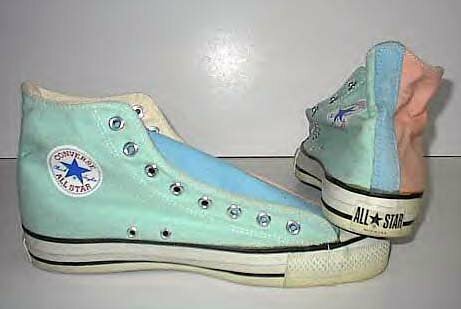 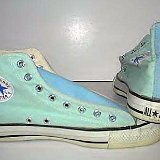 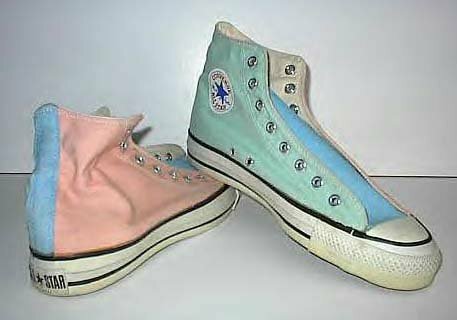 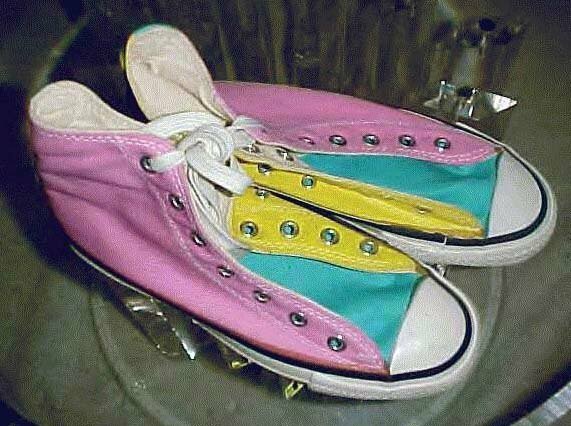 68 Collectors Items Tricolor high tops in pastel green, blue, and pink, inside patch and rear views. 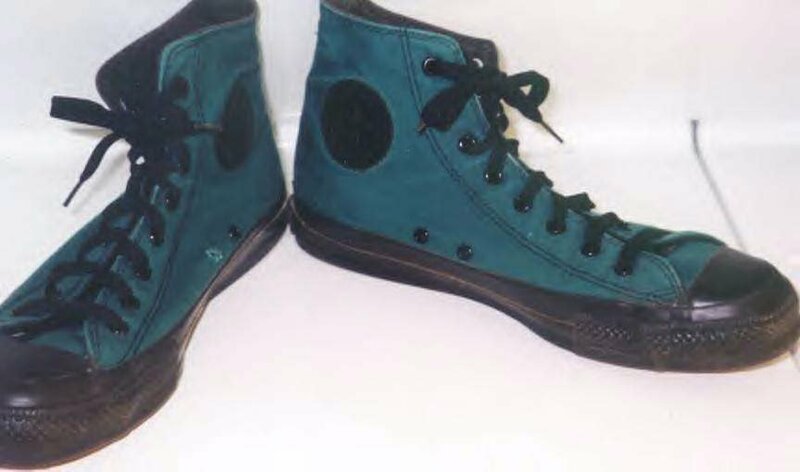 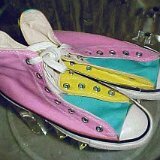 69 Collectors Items Pastel green, blue, and pink tricolor high tops, angled inside patch and outside views. 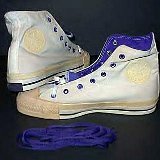 70 Collectors Items Tricolor high tops in white, purple and gold, inside patch views. 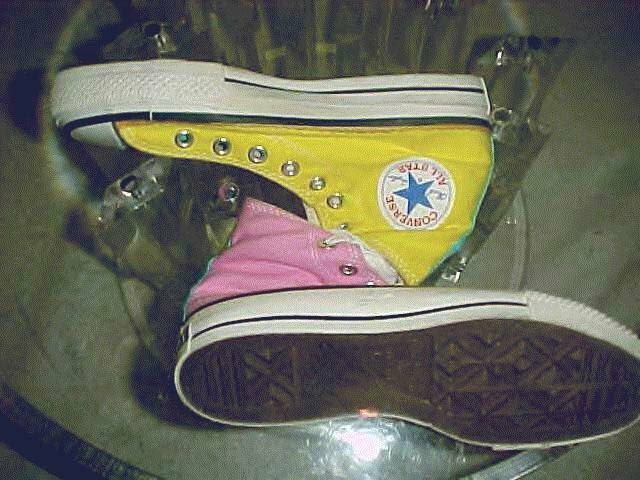 71 Collectors Items Tricolor high tops in pink, yellow, and teal, top view. 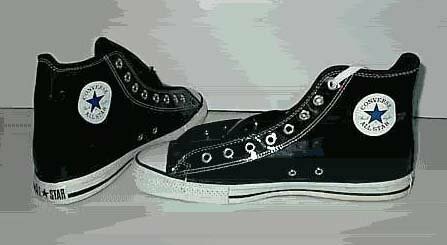 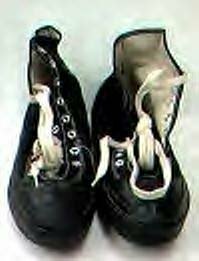 72 Collectors Items Worn vintage black high tops, front view. 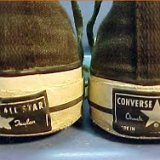 73 Collectors Items Worn vintage black high tops, view of rear heel patches. 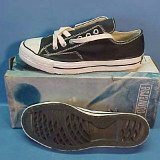 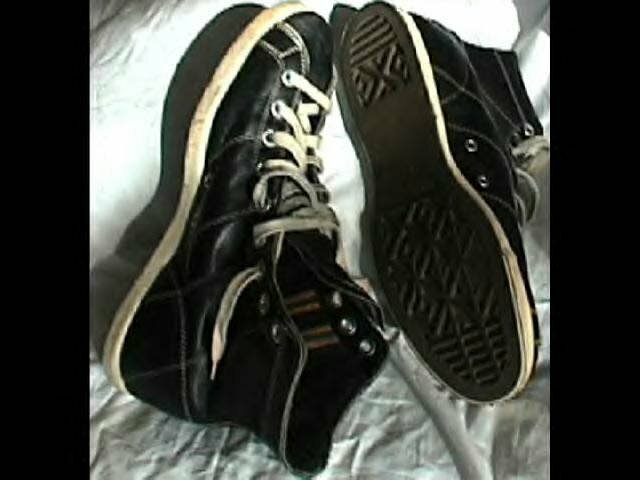 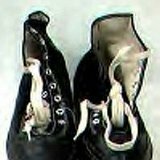 74 Collectors Items Vintage black "Coach" model low cut with box, side and outer sole views. 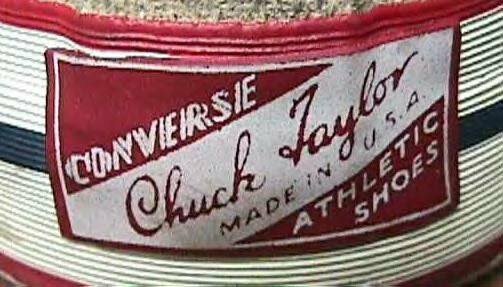 75 Collectors Items Closeup of the heel patches of vintage Chuck Taylor white high tops. 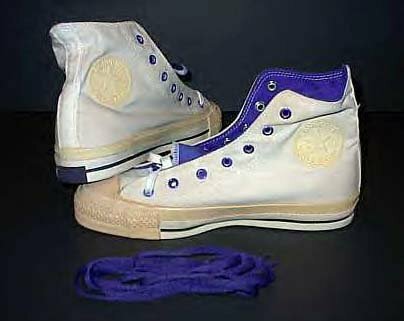 76 Collectors Items Vintage white high tops with gold toe caps, closeup of the toe caps. 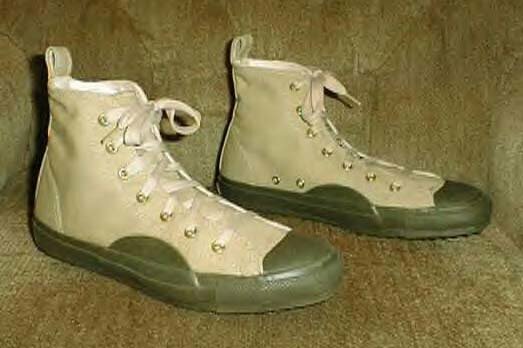 77 Collectors Items Vintage white high tops, with gold toe caops, front and angled side views. 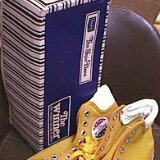 78 Collectors Items Vintage white high tops, angled side views. 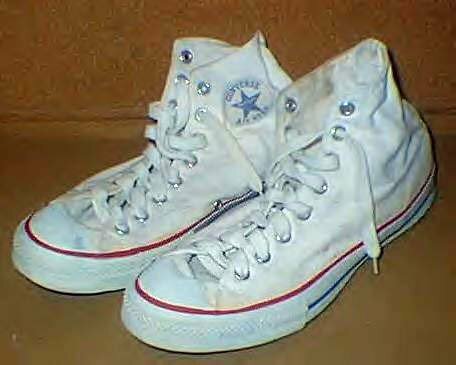 79 Collectors Items Closeup of the heel patches of vintage white high tops. 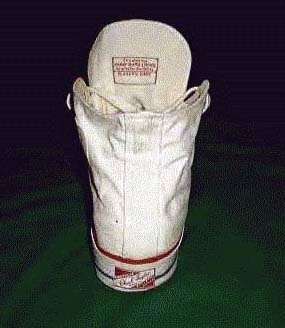 80 Collectors Items Rear view of a vintage white high top. 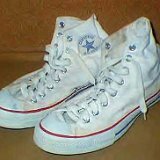 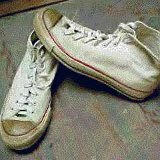 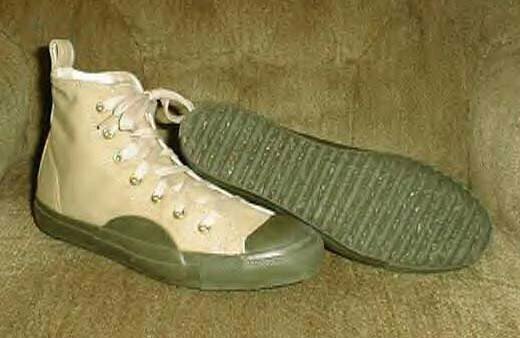 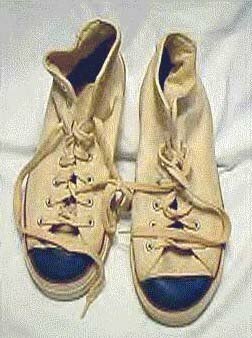 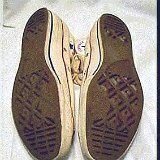 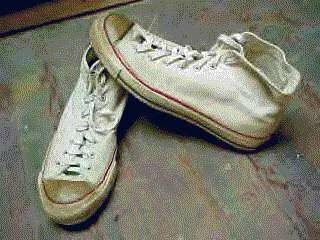 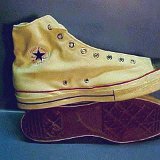 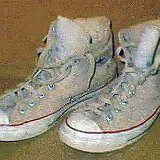 81 Collectors Items Worn 1960s vintage white high tops, angled front view. 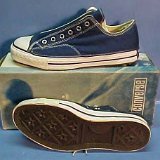 82 Collectors Items Vintage navy blue "Coach" low cuts with box, side and outer sole views. 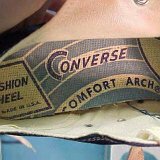 83 Collectors Items Rear heel patch for a Converse "Coach" navy low cut shoe. 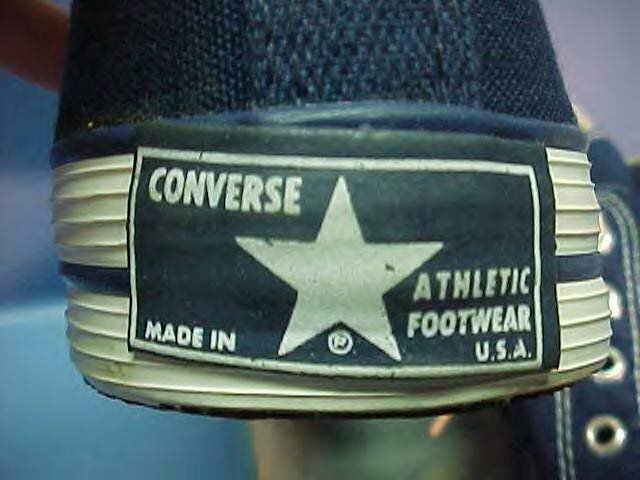 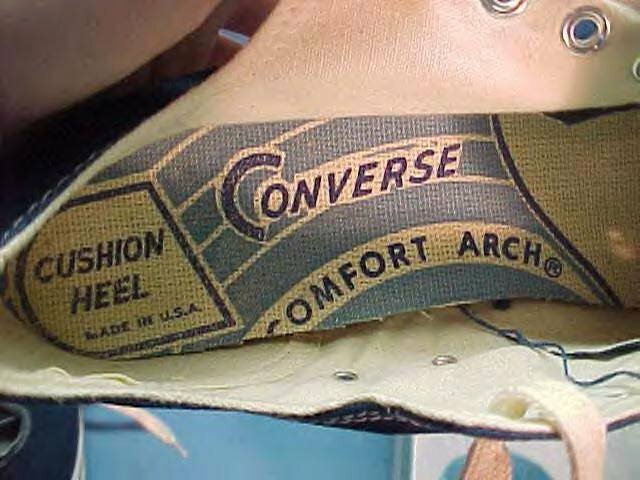 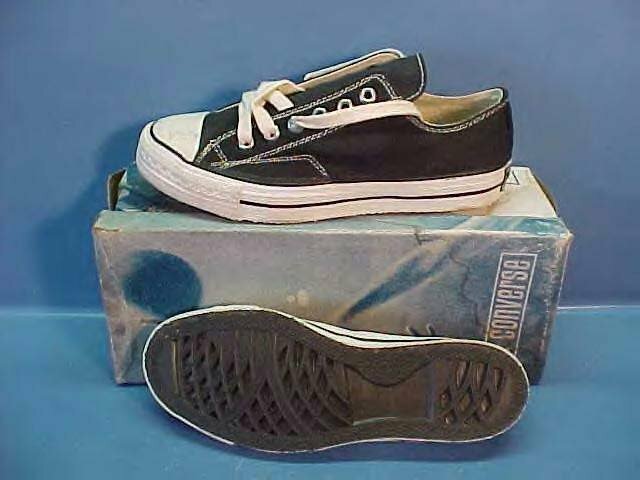 84 Collectors Items Inner sole of a navy blue Converse "Coach" shoe. 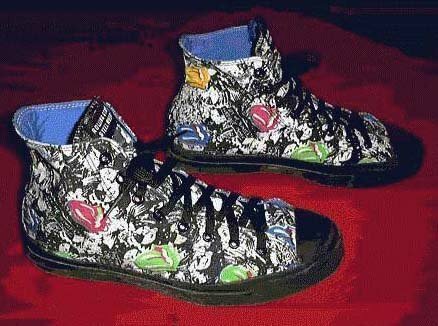 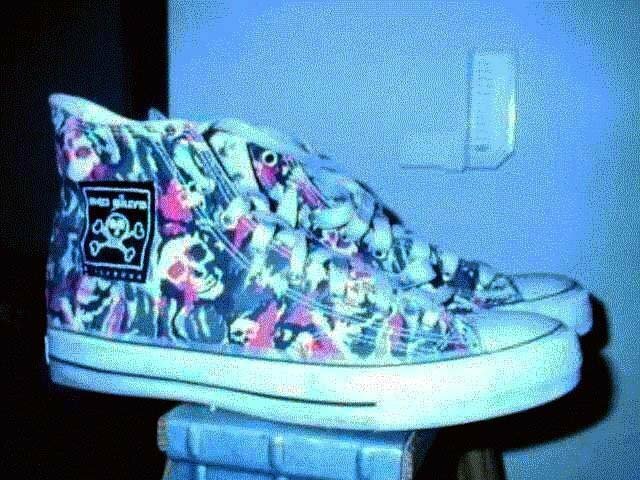 85 Collectors Items Monochrome black high tops with weird frog canvas pattern, front to top views. 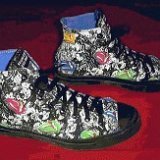 86 Collectors Items Monochrome black "Weird Frog" high tops, side views. 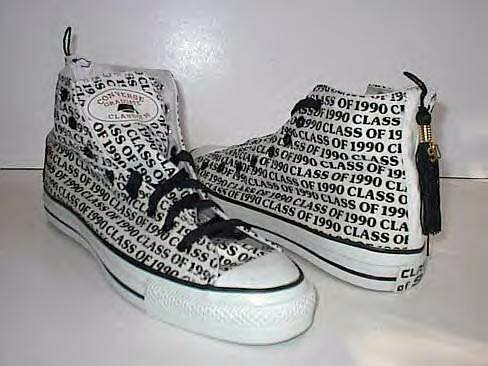 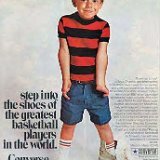 87 Collectors Items Converse black high top stripes.